Looking for a solution to recover deleted photos from 7/7 Plus? This guide will tell you how to retrieve deleted photos from iPhone 7 directly even without backup. With the improved camera of iPhone 7, we can always take beautiful photos in everyday life. The precious pictures record many happy moments in our life. 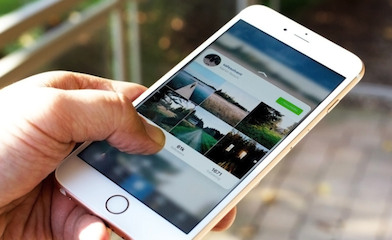 So when you lose or accidentally delete some photos, you definitely want to recover deleted photos from iPhone as soon as possible. 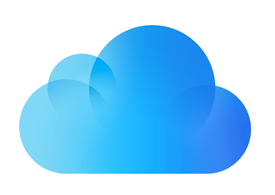 If you have made a backup with iTunes or iCloud in advance, you can retrieve the deleted photos by restoring your iPhone from iTunes or iCloud backup directly, but the backup will replace all the existing data and settings on your device. What’s worse, if you chose the wrong backup that doesn’t contain the photos you need, not only can you can’t recover the lost photos, but also lose all your iPhone data. Well, if you didn’t make a backup before, you don’t even have the chance to choose a backup might right. 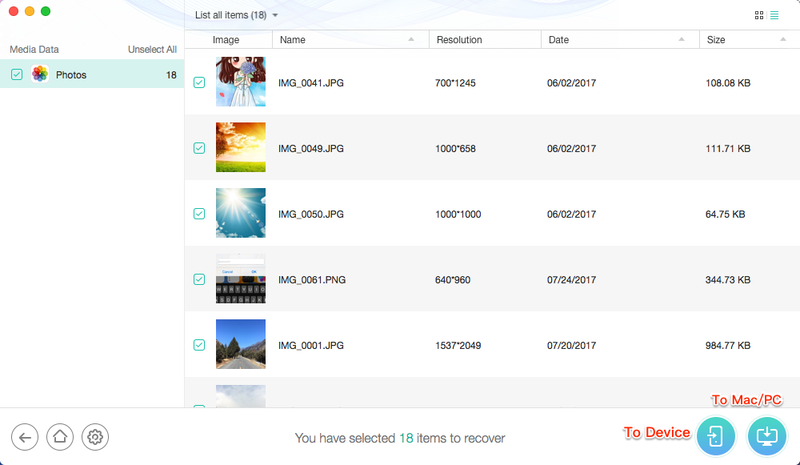 In this case, how to recover permanently deleted photos from iPhone 7/7 Plus? Don’t worry. 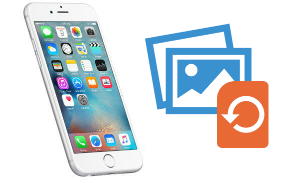 This following text will share you 2 methods to recover deleted photos on iPhone 7/7 Plus. One is recovering without backup. The other one is recovering with backup but guarantees no data loss and enables preview backup details to make the accurate recovery. Let’s check in detail. Since most users who want to recover deleted iPhone 7 photos do not have a backup, so we talking about how to recover deleted photos from iPhone 7 or iPhone 7 Plus without backup. 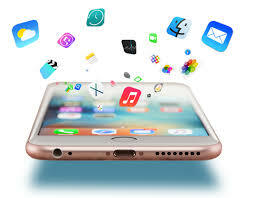 You may not know that the deleted photos just been marked deleted and became invisible stays somewhere on your iPhone, that’s why best professional iPhone data recovery tool can help you find and recover them even without backup. 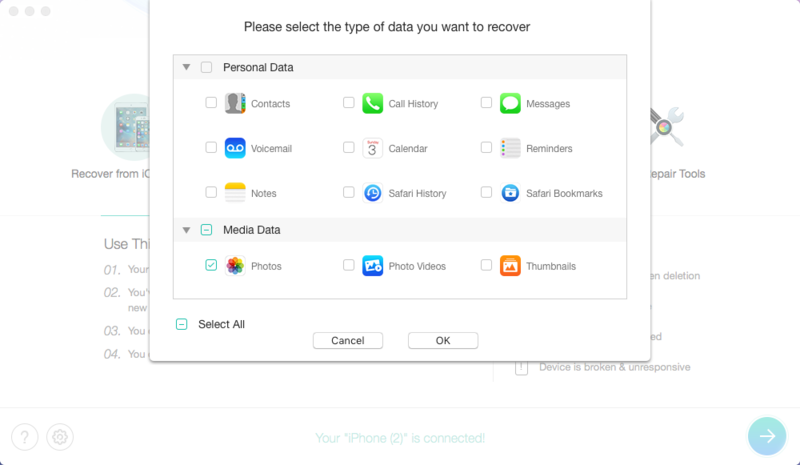 Here we’d like to share you an award-winning iPhone data recovery PhoneRescue to help you recover deleted photos from iPhone 7 just in 3 steps. Before starting, let’s have a brief understanding of the tool you’ll need. 1. 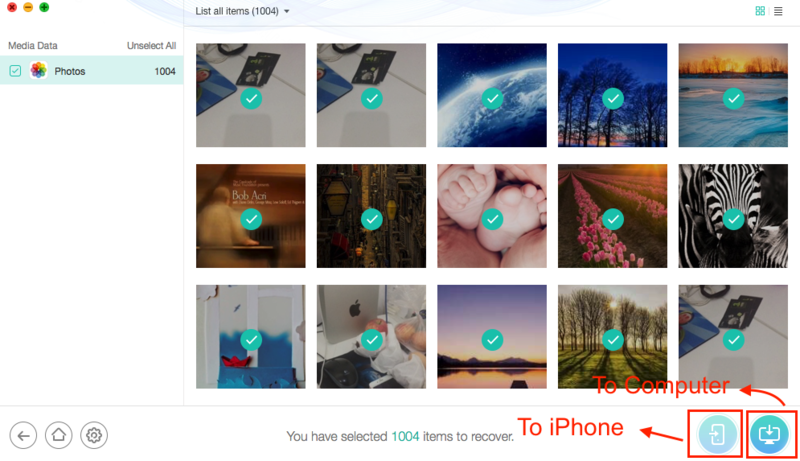 Helps you recover deleted photos from iPhone 7 directly, even without any backup. 2. 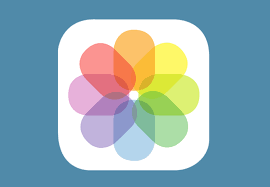 Supports recovering all kinds of photos and photo videos on your iPhone, like photos from Camera Roll, Photo Stream, Photo Library, WhatsApp, Message app, etc. 3. Enables you to preview and select the deleted photos before recovering, which makes it possible for you to recover the photos you needed most. 4. 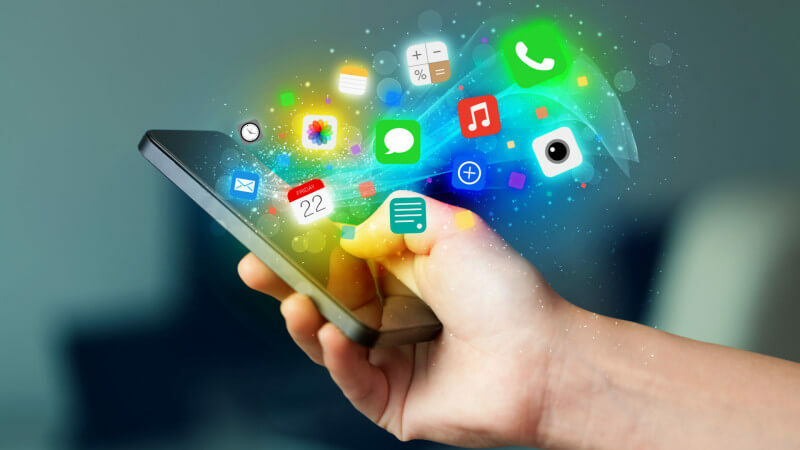 Besides iPhone 7, it works perfectly with all iPhone models and compatible with all iOS versions. In addition, it also supports recovering data from other iOS devices: iPad/iPod touch. 5. Promises you: “60 Days Money Back Guarantee”. If you failed to recover deleted photos within 60 days of purchase, you’ll get the 100% risk-free unconditional full refund. 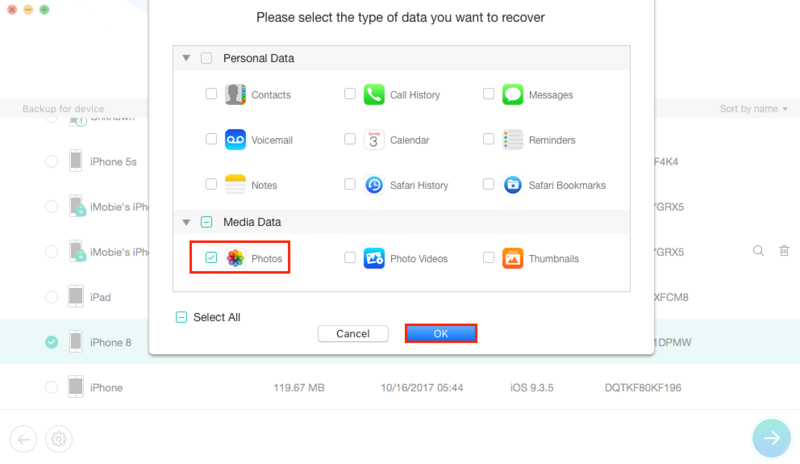 Now, download PhoneRescue for iOS and follow the steps below to retrieve deleted photos from iPhone 7/7 Plus within 3 steps. Step 1. Open PhoneRescue for iOS > Connect your iPhone 7 to computer via USB cable > Select Recover from iOS Device > Click on Right Arrow to scan your iPhone. Step 2. 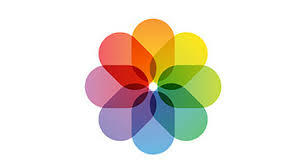 Choose Recover from Normal Mode and click Next button > Check Photos Only and click OK to scan your device. Step 3. Select Photos > Select Only list deleted option > Select the photos you want to recover > Click on To Computer button to get them to your Mac or PC. 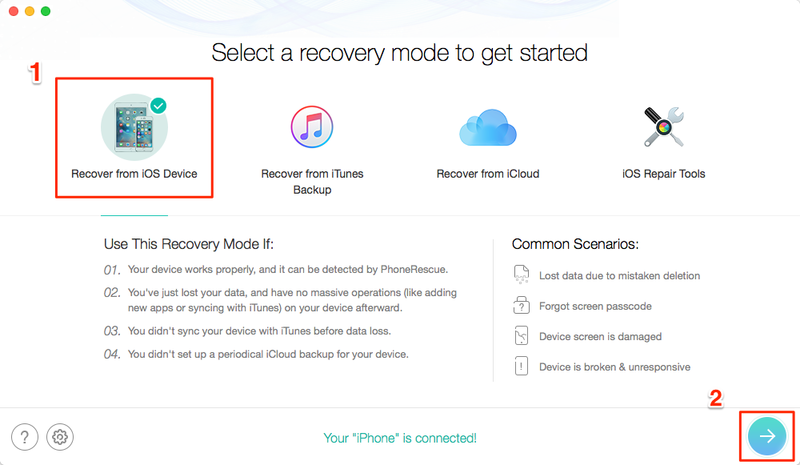 To recover deleted photos on iPhone 7 with backup but don’t replace the current data on iPhone, you can make it with iPhone data recovery PhoneRescue as well. It allows you to preview and restore individual photos instead of all the backup files which greatly makes the recovery more accurate. 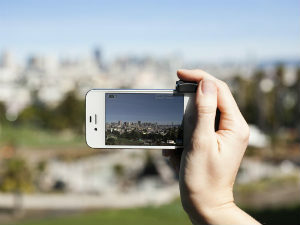 More than anything, it won’t wipe any data on your iPhone, perfectly keeps your data security. Step 1. 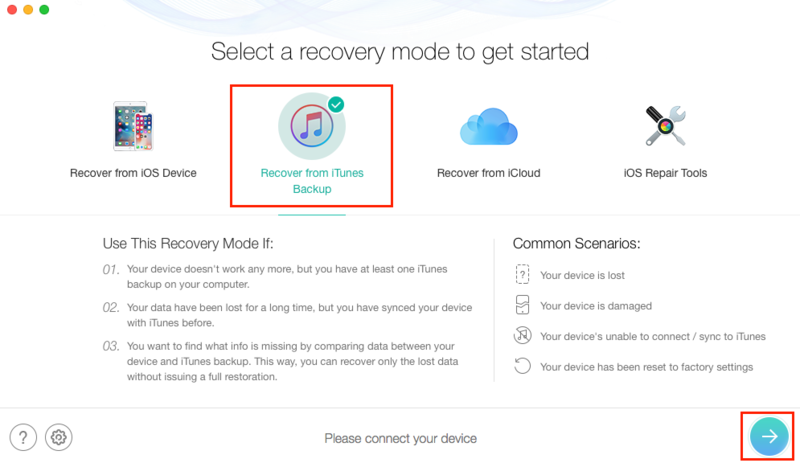 Download PhoneRescue for iOS and install it on your computer > Select Recover from iTunes Backup and click the arrow button at the right bottom. Step 2. Select a backup and click the arrow. You can choose to scan all data on backup or get only the differences between iPhone and backup. Then, only choose Photos and click the OK button. Step 3. 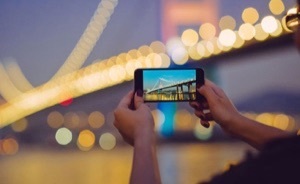 Preview and select the photos you want to recover > Click on To iDevice button to recover them to your iPhone, or To Computer button to download them to your computer. 1. 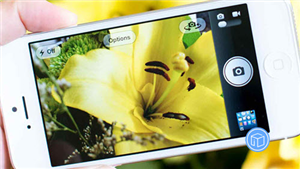 If you want to recover deleted photos to your iPhone 7 directly, please connect your phone to the computer in advance.